The Maxiline VMBF SE design prevents the cover from being opened until the vessel has been properly vented. A threaded spindle mechanism, operated by a hand wheel, opens the clamp so that the cover can be raised with the help of a spring assisted hinge. The entire process takes less than 30 seconds compared to the 10 MINUTES or more it takes to open a vessel with bolted closure. 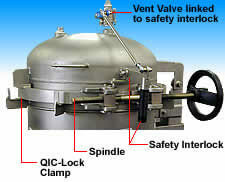 The vessel cannot be re-pressurized until the Qic-Lock clamp has been fully closed and the safety interlock engaged which closes the vent valve. *Pressure differential and other factors can affect flow rate. Max. flow is without bags at 10 fps pipe velocity. **4.5 sq. ft. per bag.